Today we saw the second two groups of this years Open House visitors in the Herbarium, a mix of locals, people from interstate and overseas. Together with yesterday’s guests we’ve seen over 90 people through to have a look at the herbarium both as an old tram barn but also as modern, working herbarium. 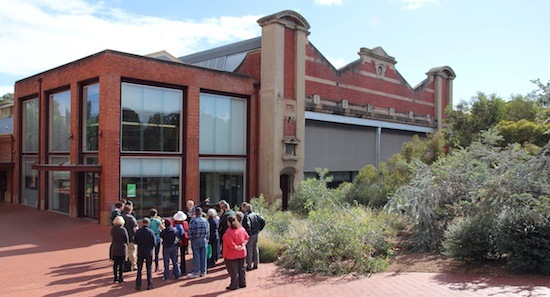 To any that are unaware the State Herbarium of South Australia is housed in the heritage-listed, 1909-built Tram Barn A building. The Open House tours were very well received. People took photographs, including aspects of the building not commonly seen, and of herbarium display material, like specimens collected on the Flinders Expedition in 1802. Presentations covered a wide range of topics including type specimens, preservation techniques, insect pest control in the vaults, weed monitoring, historic specimens, insights from molecular (DNA) data and the Herbarium’s contribution to the Global Plants Initiative. This entry was posted in Events, News on 4 May, 2014 by Ainsley.